In the last post of this series about Dr. Howard Gardner’s Theory of Multiple Intelligences, we learned how to identify characteristics of the musical intelligence. Now we’ll look at some activities you can do at home to strengthen your child’s music-smarts. Remember, regardless of how each person is most inclined to learn, everyone is gifted with all nine intelligences. Improve your family’s body-smarts by incorporating these activities into your week! Create songs/rhythms to help remember new things. Make a game of clapping, tapping, singing or rhyming with your child when he learns something new. Use the tune of a familiar song, or make something up entirely new! For example, using the tune from Mary Had A Little Lamb: Music glues things in your mind, in your mind, in your mind; music glues things in your mind, & rhyme when you have the time. Visual Listening. Choose a dynamic instrumental song (something from Fantasia will do nicely), and explain that you and your child are going to imagine a story in your minds based on what you hear. Ask your child to close her eyes, lay back and let her imagination follow the song. (You should do this too). When the song ends, talk about what you experienced: What did the song make you feel? What did you see in your mind’s eye? Musical Art. After having done the visual listening, paint or draw while listening to that same song. (This can be done without doing the visual listening first). Play a few different styles of music, and draw or paint with your child based on how you both experience the songs. Connect the dots between the music, how it makes you feel, and related colors/shapes/images! Rhythm Games. Make your rhythm games fun and improvisational. Clap a short rhythm, and ask your child to try. Get progressively trickier by adding stomps or snaps, and making the rhythms a little longer. Make sure to invite your child to make up a rhythm for you to try as well! Music Lessons. 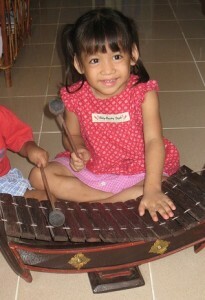 If possible, help your child develop their abilities with music lessons. Whether they play piano, guitar or the flute, practicing a little bit every day under the guidance of a good teacher will yield wonderful results. 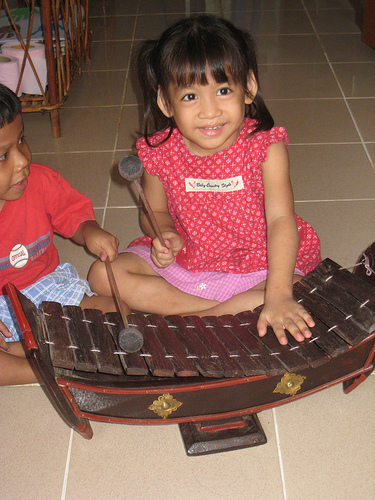 What other activities can you do to cultivate children’s musical intelligence?